Run any 4 GHRs and the 5th run is free! You will be added to our Hall of Fame and also get a special bib with your name at ALL runs thereafter. Other special privileges may be added. Go Heritage Runs and #runcations are more fun with friends and family! And there are great discounts if you come together. If you are on the Hall of Fame you get a unique discount code you can use to get 10% off on future runs. You can also share that discount code with your friends who have never run with Go Heritage Runs before – and they get a 10% discount when they use your code to sign up for the first time. Note: The 10% discount on the registration fee will be refunded to you after you sign up. Special discounted rate only for GHR Ooty run weekend for the campsite accommodation at the Aventura Ooty campsite at just INR 1223 per person when you sign up to run at GHR Ooty this June. Apart from our upcoming runs, we have a lot more planned for 2019 – including building products and events aligned with your fitness journey. So tell us about your fitness journey by taking this survey. It should take about 5 minutes and as thanks, we will give you INR 150 off on a future Go Heritage Run. An exclusive Ooty runcation can be organized if your are a group of more than 15 runners, in addition to getting the group registration discount. If you are a large group of more than 100 runners, the entire campsite will be blocked for your group too. Use discount code MPRUNNER5K to sign up for the 5KM at a flat fee of INR 500 + GST. You will need to upload an identity proof showing a residential address in Madhya Pradesh. Use discount code MPRUNNER10K to sign up for the 10KM at a flat fee of INR 500 + GST. You will need to upload an identity proof showing a residential address in Madhya Pradesh. Use discount code MPRUNNER21K to sign up for the 10KM at a flat fee of INR 500 + GST. You will need to upload an identity proof showing a residential address in Madhya Pradesh. Discounted registration rates for local runners are available at all runs in M.P and may be available at other runs too. To avail this discount, please present a valid address proof at the run registration venue (M.P Tourism hotel for runs in M.P). Local registrations are opened in the last 5 days before the run and are available only offline at this time. Use discount code COORG100 to avail an early registration discount of Rs. 100 on all distance categories. Sign up by March 1 to avail an early registration discount of Rs. 100 on all distance categories. This discount is already accounted for in the final fees charged and you do not need to enter a separate coupon code. Sign up by March 4 to avail an early registration discount of Rs. 100 on all distance categories. This discount is already accounted for in the final fees charged and you do not need to enter a separate coupon code. When your friends sign up with the unique referral code in your confirmation email, they get 10% off on their run registrations. If three friends who’ve never run with us before sign up, you’ll get a free T-shirt at your next Go Heritage Run. If five friends who’ve never run with us before sign up, you’ll get a free entry to a Go Heritage Run of your choice. Includes: 20% off if you sign up for Go Heritage Run – Srirangapatna by the 18th of October. 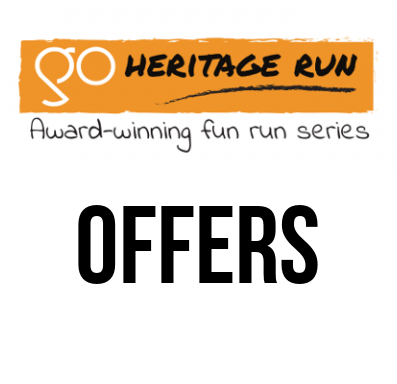 Includes: If you signed up for Go Heritage Run Ooty before the 30th of April, you are eligible for a discount on your run in Go Heritage Run Coorg. Check your email Inbox for a discount code (if you cannot find an email, please check Spam or Promotions folders too). Includes: A free run registration to anyone who shares a detailed heritage run route in their city or anywhere else in the world. Click here to submit your entry – we may request you to provide additional information about the run route if your submission isn’t complete. But once you do, you get to run in Orccha this October absolutely free. You refer a friend to sign up for GHR Badami between 4th August and 11th August. When signing up, ensure your friend enters your registration id in the Coupon Code field before he clicks Submit.